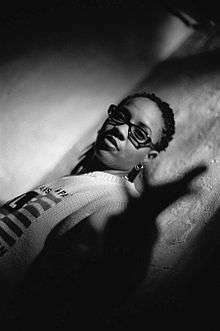 MC Lyte (born Lana Michelle Moorer on October 11, 1970) is an American rapper who first gained fame in the late 1980s, becoming the first solo female rapper to release a full album with 1988's critically acclaimed Lyte as a Rock. She has long been considered one of hip-hop's pioneer feminists. Lana Michelle Moorer was born in 1970. Raised in Brooklyn, New York City, New York, she began rapping at the age of 12. Though untrue, there has been a widely circulated rumor that MC Lyte is the younger sister of Milk D and DJ Giz, the hip hop duo Audio Two. Two years afterward, Lyte's fifth album, Bad As I Wanna B, featured production from Jermaine Dupri and Sean Combs. Its hits were "Keep on, Keepin' On" and "Cold Rock a Party", the latter of which also featured then up-and-coming rapper, songwriter and producer Missy Elliott. :8 This album was her first with East West Records America and became successful after the aforementioned singles became big hits with "Keep on, Keepin' On" peaking at the top ten and "Cold Rock a Party" peaking at number eleven. It was her second gold album. Her 1998 follow-up, Seven & Seven, however, was not as successful. She left East West America by the end of the decade. Lyte released the independently produced record The Undaground Heat, featuring Jamie Foxx, in 2003, which was notable for the song "Ride Wit Me". The single was nominated for both a Grammy and a BET Award. MC Lyte's song "My Main Aim" was the title song of the video game NBA Live 2005 by EA Sports. In 2005, she released two songs produced by Richard "Wolfie" Wolf called "Can I Get It Now" and "Don't Walk Away" (with Meechie). In 2007, she released a song called "Mad at Me" and, in 2008, two songs called "Juke Joint" and "Get Lyte". In 2009 a song titled "Brooklyn" was released, as well as "Craven". Lyte has been featured on television as herself on such shows as MTV Unplugged, In Living Color, Moesha, Cousin Skeeter, New York Undercover, My Wife and Kids, and Sisters in the Name of Rap. She also acted on TV in such shows as In the House, Get Real, Half & Half, and The District. Her first acting role was in 1991, an off-Broadway theater play titled Club Twelve, a hip-hop twist on Twelfth Night alongside Wyclef Jean, Lauryn Hill, and Lisa Nicole Carson. After she made her film debut in the 1993 movie titled Fly by Night, starring alongside Jeffrey Sams, Ron Brice, and Steve Gomer, she also starred other films, such as A Luv Tale (1999), Train Ride (2000), Civil Brand (2002) and Playa's Ball (2003). In 2011, she guest starred in the Regular Show episode "Rap It Up", portraying a member of a hip-hop group also including characters voiced by Tyler, the Creator and Childish Gambino. MC Lyte served as the DJ of choice at Michael Jordan's 50th Birthday Celebration, at his 2013 wedding reception, and at Jay Leno's farewell party. In October 2006, MC Lyte was one of the honored artists on VH1's annual award show Hip Hop Honors. She was joined by fellow female MC's Da Brat, Remy Ma, and Lil' Kim as they performed some of her tracks, such as "Cha Cha Cha", "Lyte as a Rock", "Paper-Thin", and "Ruffneck". In 2013, MC Lyte received the Lifetime Achievement Award at the 2013 Hip Hop Inaugural Ball. She was the first female solo hip hop artist to receive BET's "I Am Hip Hop" Icon Lifetime Achievement Award. making her the first female solo hip hop artist to receive the honor from the network. She did the voice of Tia for the Mattel toy line Diva Starz until the toy's discontinuation due to low sales after the toy's short lived success. ↑ "MC Lyte: Still Rockin' With The Best (Interview by Han O'Connor)". Allhiphop.com. 2010-01-13. Archived from the original on January 16, 2010. Retrieved 2010-01-18. 1 2 "MC Lyte Biography". Starpulse.com. Retrieved 2015-05-08. ↑ "Ladies First: 31 Female Rappers Who Changed Hip-Hop". Billboard.com. 2014-03-31. Retrieved 2015-05-08. ↑ "MC Lyte reps feminist beat at hip-hop conference". The Metropolitan. Retrieved 17 June 2013. ↑ "MC Lyte". Philadelphia CityPaper. Retrieved 17 June 2013. ↑ Joan, Newlon Radner (1993). Feminist Messages: Coding in Women's Folk Culture. University of Illinois Press. 1 2 3 4 Orcutt, KC (March 25, 2016). "The First Ladies Of Rap: MC Lyte". The Source. Retrieved September 2, 2016. 1 2 MC Lyte. "MC Lyte". HalftimeOnline.net (Interview). Retrieved September 2, 2016. Actually Milk and Giz are totally like my brothers but they are not my blood brothers but I was basically raised within that family. ↑ [Unknown]. "MC Lyte". HalftimeOnline.net. Retrieved September 2, 2016. Lyte came in the game at a very early age linking up with Audio Two (And unlike every bio states those are NOT her brothers) when they were seeking out a female MC. 1 2 3 4 5 6 MC Lyte (January 7, 2011). "Full Clip: MC Lyte Breaks Down Her Entire Catalogue (Brandy, Janet Jackson, LL Cool J & More)". Vibe.com. Archived from the original on July 15, 2014. Retrieved September 2, 2016. ↑ "MC Lyte Returns, Charts With 'Dear John' From Next Album". Billboard.com. Retrieved 2015-05-08. ↑ Coleman, C. Vernon (2015-04-18). "MC Lyte Drops Her First Album in 12 Years, 'Legend' - XXL". Xxlmag.com. Retrieved 2015-05-08. ↑ Diaz, Evelyn. "MC Lyte Goes Vinyl for New Album". BET.com. Retrieved 2015-05-08. ↑ "MC Lyte's diary goes to Smithsonian". Latin American Herald Tribune. ↑ "Hip-Hop Comes to the Smithsonian" (Press release). National Museum of American History. 2006-02-28. Retrieved 2008-03-06. ↑ "Celebrity Rap Superstar – Ep. 101 – Let the Raps Begin". MTV. ↑ "MC Lyte, Birthday on October 11th, MC Lyte Biography, Career, Achievements". Altiusdirectory.com. 1971-10-11. Retrieved 2015-05-08. ↑ "Thurgood Marshall College Fund Presents iLead". Thurgood Marshall College Fund. 2013-05-01. 1 2 MC Lyte (January 13, 2015). "MC Lyte Explains How To Join The Recording Academy & Vote In The GRAMMY Awards". HipHopDX.com. Retrieved September 2, 2016. ↑ Grimm, Marrio (2010-10-29). "MC Lyte on Her Site for Women 'Hip Hop Sisters'". HipHopClub.biz. Retrieved 2010-10-29. ↑ "Two MC Lyte $100,000 First Wave Scholarship Winners: 2nd Year in a Row". HipHopSisters.org. 2012-09-04. ↑ "VH1 Hip Hop Honors 2006: Da Brat Does MC Lyte". Vh1.blogs.com. 2006-10-13. Retrieved 2015-05-08. ↑ "MC Lyte to Be Honored With I Am Hip Hop Award". BET. 2013-09-12.